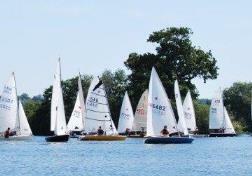 Three 45 minute races this Sunday, starting at 13:45hrs. We will use three different handicap systems, one per race. The first will be based on usual pursuit race personal handicaps; second will be based on RYA recommended handicaps for use at our water and third the usual RYA handicaps. The second type will also be sued in a summer series later this year and are meant to be the most suitable for us to use as a club. List of handicaps to be used by all entries are in attached below. Note that personal handicaps have always been calculated relative to Mike Pritchard in a Laser and thus he will sail off 1095 as a personal handicap and all others are adjusted relative to 1095. Worth noting that the AC and RYA handicaps for a Laser are the same 1095.